Anything in the world can turn into an obsession. You may love food, but if you think about it all the time and can never get enough you might have a problem. If you love shopping, but then find yourself shopping over your budget all the time, you may have a problem. The same holds true for gambling. If you enjoy gambling and can keep yourself to a budget, then you’re probably having a great time with your gaming. If, however, you think about it all the time or show some other important signs, then you may have a problem. 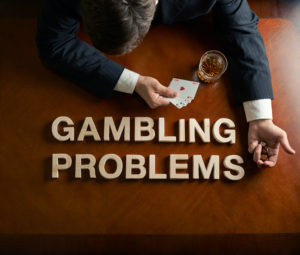 Here are some clear-cut signs that you might have a problem and could use someone to talk to or other tools for dealing with a gambling issue. Certainly, there isn’t one article that is going to be able to clearly and completely tell you if you have a problem with gambling. What an article like this can do, however, is to give you some warning signs and some things to consider. You may want to think about these issues and see if they are true for you. If a few, or more than a few, are true for you, then you might have a gambling problem. You can talk to a spouse, a therapist, a friend or a colleague to see if you need to get help to deal with your problem. There are certainly ways to deal with it and to move away from the problems you may be developing. Here are some of the ways to know if you have a problem with gambling. If you find yourself lying to others about how much you gamble or when you gamble, this could be a sign of trouble. For instance, if you find yourself sneaking off to the study to gamble when you’re supposed to be folding laundry, or you hide your late night gambling from a spouse, these are the types of behaviors that could be red flags. If you spend more than you are really able to afford, or you spend more each time that you play, these are other flags. If you find yourself always thinking about gambling and having trouble concentrating on other things, this could signal a problem. Sure, we all enjoy thinking about things that are fun, but if you’re with your kids at the pool and you can’t wait to get back to the online gambling, then that’s an issue potentially. Or if you are doing something else fun, but you want to get back to gambling, this is not always a natural thing to desire. Let’s say that you have tried to stop gambling so much, but you find yourself having withdrawal symptoms. This is another sign that there might be an issue. This is true for people with most obsessions, so they become agitated, irritable or impatient when they cut back. Also if you find yourself gambling to forget your problems, you may have a problem. If you are really sad about something and you turn to gambling, or if you are having money issues and stress at home and you turn to gambling to forget about it, you may have a problem. Certainly, if you find yourself overborrowing from others or stealing in order to keep your gaming going, then you might have a problem. These are just some of the warning signs that you could have a problem, or that someone else you love might have one. There is help available and it’s very important to take advantage of that help if you think that it’s necessary.